Central Aroostook's Katie Levesque, right, sends the ball down the field Wednesday as Ashland defender Shelby Stolze tries to disrupt the play. Levesque had four goals to lead CA to a 4-3 overtime victory over Ashland in the Class D North championship. Saturday’s weather forecast called for a chance of thunderstorms. While no such outbursts materialized at Morse High School in Bath, the North Yarmouth Academy offense struck quickly like lightning during its Class D girls soccer title game against Central Aroostook of Mars Hill. The South champions utilized their ability to score quickly on counterattacks, scoring twice in the game’s first 10 minutes on their way to a 3-1 victory over the North titlists at McMann Field. 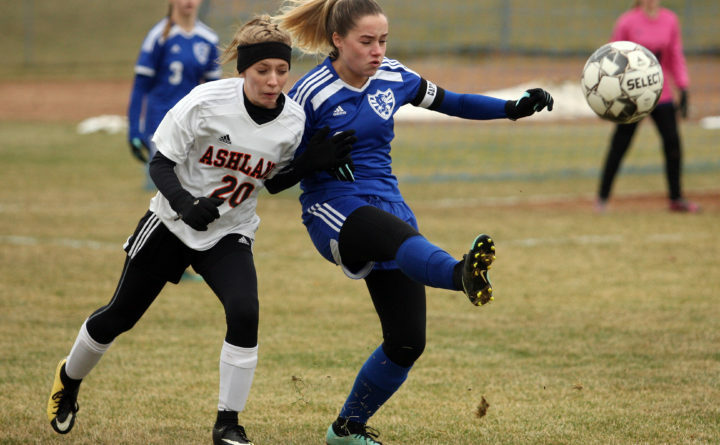 NYA completed the season at 14-3-1, winning the school’s first girls soccer state championship in Class D. It was the program’s eighth title overall. Central Aroostook wound up 16-1-1. NYA not only exhibited the ability to score quickly, its defense proved dependable. It was able to limit high-scoring Central Aroostook striker Katelyn Levesque. The South champs paid the requisite attention to the junior scorer, who had registered 38 goals this season among 107 in her three-year career going into the game. Levesque had a handful of chances, but had to work hard to get the ball and get open and wound up with a single goal. NYA wasted no time taking the upper hand. Junior Serena Mower found herself with the ball and some space at the top of the penalty area and chipped a shot over the head of Central Aroostook goalkeeper Olivia Blackstone. It was less than 7 1/2 minutes later that NYA extended the lead, even though it was attacking into the teeth of a gusting wind. This time, Rylie McIntyre made a short run down the right side and fired a shot back against the grain, past Blackstone and into the far right-hand side of the goal to make it 2-0 at the 9:50 mark of the first half. Despite its inability to mount any consistently cohesive offensive sequences, CAHS did sustain some pressure in the NYA end for about a two-minute span. Levesque took a corner from the left side that made its way right in front, where goalkeeper Carly Downey punched it down. Central Aroostook forced another corner and Levesque’s serve was headed into the air, then into the middle, but was ultimately cleared. One more time, CAHS was awarded a corner. This time, Levesque’s ball was headed down by Breann Bradbury and it bounced up and off the crossbar, then was cleared out to the left of the goal. Levesque was waiting and lofted a shot over Downey to make it 2-1 with 16:47 remaining in the first half. The goal energized CAHS, but it could not follow up on the tally. It took less than nine minutes for NYA to counter with what would prove to be an insurance goal. It came as the result of what wound up being a 2-on-1 with Mower and Natalie Farrell attacking against a single defender. Mower ran down the left side and slid the ball back into the middle, where an unmarked Farrell hit a low shot just to the right of Bradbury with 8:22 to play in the half. That would be the end of the scoring.